Yesterday was Take Your Child To Work Day. Since my son already missed a day of school and I work from home, my kiddo went to school as usual. Did you bring your child to work yesterday and what did he/she do for the day? 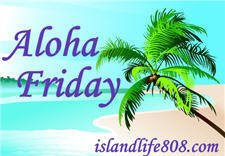 10 comments on "Friday Follow & Aloha Friday"
because I get to meet and make new friends in the blogging world! I work at home so I guess in a way yes. Nope! I don't have any kids! Have a great Friday!! I didn't even know this so no. That would have been an adventure to say the least though! Here from Friday Follow and Aloha Friday. Now following :) No kids, but I didn't even know it was Take Your Child to Work day! Following now from Friday Follow. Hope you'll follow back!